"Crabtastic" raved the blurb in the paper. I'd never heard of Elixir, the restaurant in the Opus hotel, but it was having a crab tasting menu and I wanted some assurance we could still do crab better on this side of the Pacific. 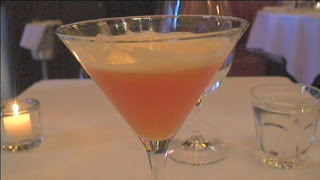 The meal started with this fine cocktail, the Opus 27. A serious celebration of orange and very refreshing after an unexpectedly long walk. Flashed me back to drinking Tang in residence at the University of Saskatchewan, how much tasty Vitamin C meant to me when it was -30 every day for a month. I loved Tang. My body loved it. The chemicals in my body revelled in the sun-filled Tang crystals dissolving in water. Slight hint of orange popsicle too. The amuse bouche is chawan mushi, an old fave. I make it with pine mushrooms, but not surprisingly here it's "Dungeness Crab, chilled custard, pickled ginger" according to the menu and a rather overwhelming portion of shitake. What appeared to be a tiny shiso leaf on top. Very arty. Very good. My theory has always been, "let's put as much stuff as possible in the custard" and Elixir agrees. The ginger doesn't kick in til the end, and it's divine. Quite a meal for an amusement. 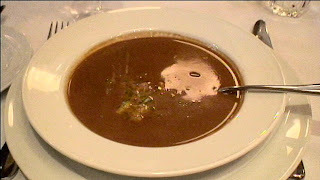 When the server inquired how I was enjoying the bisque, I said it had stripes of flavour. The crab was one. The most interesting use of celery I've encountered since childhood. "Spicy coconut, Dungeness crab, lemon grass" purred the menu, perfectly accompanied by a glass of Misison Hill 2005 SLC Sauvignon Blanc/Semillion. Where ordering crab in Japan, I wondered what they did with it. It seemed to have dissappeared, as the plastic meals that beckon you have taken over. Here, crab luxuriates in its roll as a pleasent undertaste that rewards the attention you pay to it. I experiment with the bread. It is a disaster. I have to shovel soup into my mouth, including a fine piece of wonderful Dungeness to cancel the bread intrusion into the subtle ocean my taste buds were swimming in. Lots of shovelling. The celery has become cloying and I fear I'll never get to the bottom of this soup bowl, when I chance upon the most wondrous morsel of curry. Married with the solid anti-taste bread, it has at last assumed its ultimate perfection. A reward! No lottery win was more welcome. Shoveling because the soup becomes increasingly unedible as it cools. A losing battle. 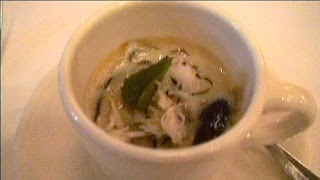 It is replaced by the main course, "Cannelloni, D. crab, age, curry lime broth," not mentioning the key ingredient, nori. I was brought to this restaurant for the "cannelloni wrapped in nori, and a crispy layer of bean curd" promised in the review. 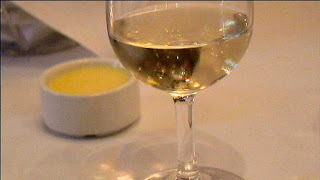 Although the accompanying chardonnay was very good, as soon as nori hit chardonnay, the magic dissolved. Nori only works while crisp. Liquefied, it overpowers both the well-chosen wine and the fine crab it is supposed to enhance. Mouth full of bummers. The cilantro and other Japaneseness about the salad also thunk against their now melted nori companion. After I wash my mouth with cold water, I modulate the pairings mores appropriately. The crackling nori does its job and the crab is jolted into an ascending excellence, pinchers snapping away. I get seriously involved with the last bits of the salad with the Japanese passport, then savour the last of the crab, successful in its mission, to represent this chef's skill with a well-loved local ingredient, and then the last of the wine, still perched upon its hill. This has to be the strangest-looking food item that has ever been presented to me. And that's saying something. 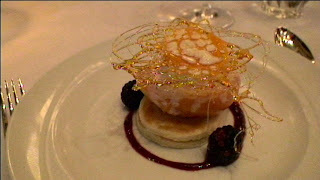 This is "Peach, asti spumanti, poached peach melba, 2004 SLC Riesling Ice Wine. " It looks and tastes like an amusement park. I'm reading Pleasurable Kingdom, about how our fellow animals enjoy pleasure, in between courses during this meal. Rather than depressing me at their loss, it kind of works as a dinner companion. Pleasure is the goal, in life, of all that have life. In death, if we bring some bacteria pleasure, what harm is there in that? So nice to see you having a great time my good friend. I have not been by in a long time and am happy to see I have alot of catching up to do. This gets my reccomendation for food blog of the web ! Keep up the exemplary work Cat.